A cup of love from last weekend. Last weekend I went to Blue Bottle Coffee in Hayes with Cory and Vincent. I don’t really like coffee. Actually, I don’t like coffee at all. I’ve always been a green-tea and honey kind of boy. There’s nothing about coffee that appeals to me whatsoever. I really enjoy dropping a tea bag into my cup and watching the clear water turn less translucent. But clear water to brown? Not my thing. Anyway, I went to a kind of pop-up shop in an alley with the boys so Cory could inject himself with some caffeine. 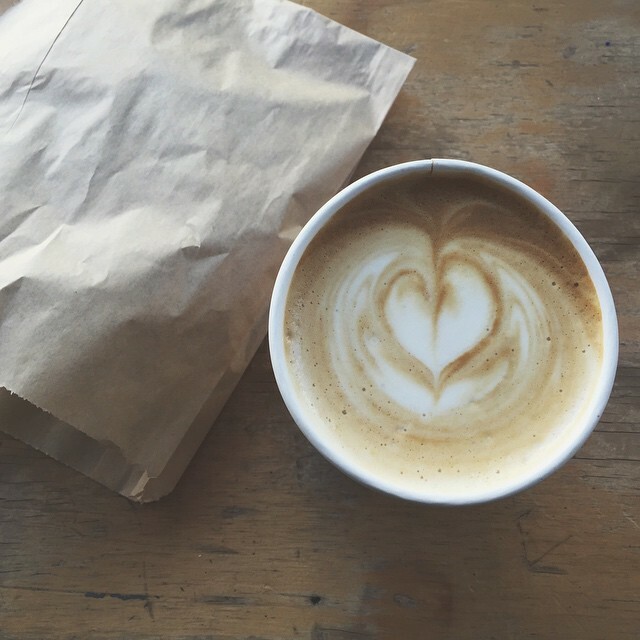 I decided to try a latte because we were there – and why not? I wanted to see what all the hype was about. Damn me for always yolo-ing. It was pretty damn good. The coffee tasted so refreshing and I just love the overall aesthetic of Blue Bottle. They seem to do the rustic and vintage shop thing really well. I was very impressed. I mean, they even did the heart/leaf art with my foam. What’s not to love about that? And to top it off, anyone that knows me knows that I’m an absolute sucker for soft-baked pretzels. I ordered a pretzel knot and regretted that as well. It was so good. I don’t know if they bake it fresh in the morning (I really doubt they do since they’re not called ‘Blue Pretzels & Co.’) but I was into it. There was a little too much salt clumped at the largest part of the knot, but it was great nonetheless. I’d go back. In fact, I’ll probably go back sometime in the next couple of weeks. There’s a nice flow of people, but for being a Saturday morning, there wasn’t a hole lot of commotion in that area, which is appreciated since the main drag in Hayes Valley is always so cluster-effed with people walking up and down, shopping and dog-walking. See you there for some more caffeine?